I spent this weekend in Snowmaggedon. That’s right- Snowmaggedon. That’s the term they’re using for the insane blizzard that hit from Pennsylvania to New Jersey. This was the weekend we chose to move my friend out of her Pennsylvania home back to Buffalo. Not exactly the best choice you might say. We had so little time to get everything done there was no stopping for a sit down dinner and the only place that delivered was Domino’s. What a great excuse to try out their new recipe. We ordered a regular cheese pie and the first thing I noticed upon opening the box was how thick it looked. I like my pizza thin and crispy and this was super doughy. Not a good texture at all. We all dug in and everyone noticed how spicy the sauce was- like a marinara. After having a few more bites we all came to the same conclusion- this tasted exactly like breadsticks and sauce from Pizza Hut. Seriously. I think it may be the same exact recipe. I got no food satisfaction from this pizza at all. In fact the only thing I got from this pie was heartburn. 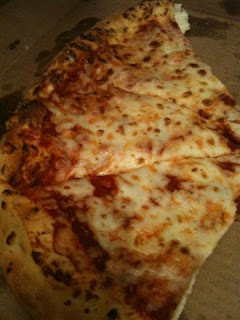 I haven’t had Domino’s since my college years but I remember the original recipe being much better than this. So our dinner was pretty bad but it gave us the energy we needed to carry on into the night. In the end we did it. Four girls, 24 hours to pack and move everything in over two feet of snow and we did it. I have the best friends in the world. We rock. I'm also feeling the effects of Snowmageddon...it's crazy! Anyways, I work with Domino's and wanted to let you know that since you're not a fan of the new recipe you can still order the old one. Just ask for "hearty marinara" sauce, no garlic on the crust and you will be good to go. It's just a blizzard. Calling it something ridiculous and overblown like "Snowmageddon" is stupid. And NYC has a serious ego problem, by the way. New York is filthy, crowded, and it reeks of urine all summer long. It's a cesspool of humanity, and I only hope rising sea levels wash it away fast. Andrew thanks for the info. I'm not sure I'll have Domino's again for a while but it's good to know I can still get the regular stuff. Anonymous...what can I say- your comment made me laugh out loud! Snowmageddon!!!!!!!!!!!!!!!!!! !